By GreenEyedLillies on October 6th, 2008 . Filed under: Accessories . You’ve always been known as a sweet person. 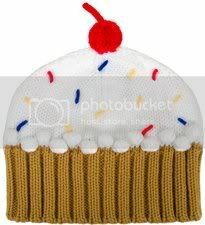 This adorable knit beanie from our friends at Neff will make you that much more memorable! Cute detailed frosting, sprinkles and a cherry on top. Acrylic. One size. Limited availability.